WE'RE ANSWERING THE QUESTIONS ABOUT SOUTHERN CALIFORNIA THAT KEEP YOU UP AT NIGHT. IF YOU HAVE ONE, ASK IT HERE. People love to point out what makes L.A. so geographically different from other American cities, be it our criss-crossing freeways, our infamous rush hour or our beautiful urban sprawl. But there is one less-considered (and perhaps underrated) transportation feature that's missing from the majority of our maps: one-way streets. That's right. Compared to cities like New York or Boston, Los Angeles is, shall we say, one-way-street light. Excluding downtown, you'd be hard pressed to find many single-direction thoroughfares, at least in L.A. proper (so excluding areas like Santa Monica and Pasadena, which both have some one-ways). Even the narrowest of canyon roads allows for opposing traffic. One LAist reader, Nicole, wanted to get to the bottom of this vehicular mystery: "Why are there barely any one-way streets in L.A.? I am from the East Coast and one-way streets are everywhere. Why not here?" Well, transportation nerds, rejoice! We have the answers. L.A. is a wee little baby compared to its eastern bros. Some of the streets in lower Manhattan were formed as early as 1660, back when New York was New Amsterdam, a generally muddy, lawless and unpleasant place, as described by historians. Cars were obviously not a thing at that point, so the streets were only wide enough to accomodate people, horses and the occasional cart. But by the time the plans for Los Angeles were laid, in the 1920s and '30s, cars were very much a thing. 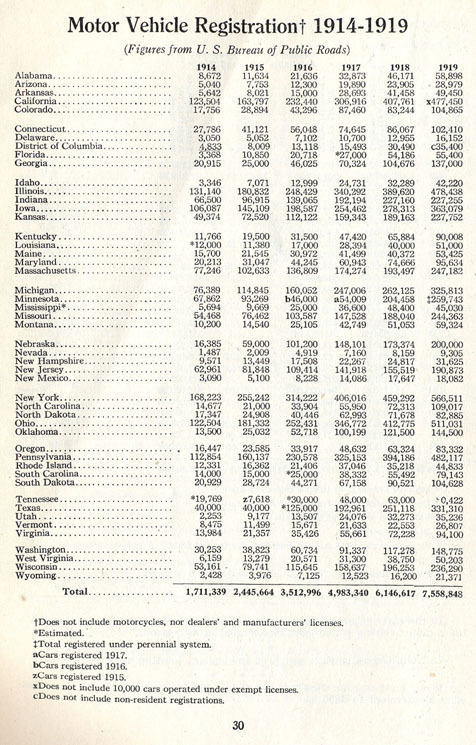 By 1919, there were over 400,000 of them in California, as well as a well-established streetcar system, which included more than 1,000 miles of rail. Hot trivia tip: L.A. used to have the biggest network of urban rail transit in the U.S. (you can tell that to your East Coast friends next time they decide to be snobs about public transportation, thank you very much). Martin Wachs, a professor of urban planning at UCLA, says this is exactly why the streets in L.A. are so wide. "They were built to accommodate two to four tracks, plus two to four lanes of traffic." 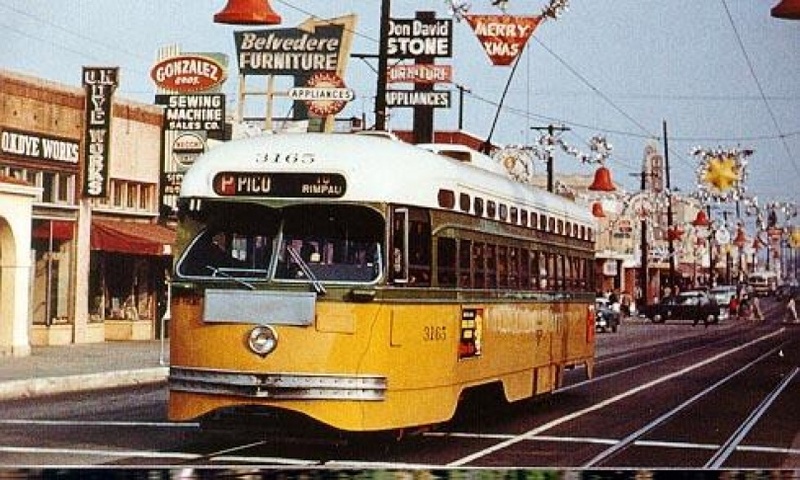 Some of the widest streets in the city were originally built for streetcars and automobiles — Venice Boulevard, Santa Monica Boulevard and even the 101 Freeway had central tracks where the medians now live. 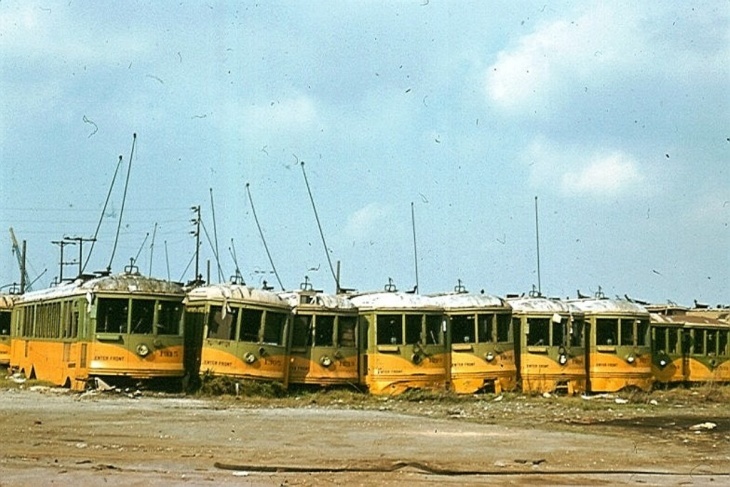 By the 1940s, streetcars were being phased out and replaced by buses due to declining ridership. But if you want a more entertaining, but less historically accurate explanation, we suggest you re-watch Who Framed Roger Rabbit?. Wachs said that one-way streets tend to work best when blocks are short and streets are narrow, so cars can easily loop around to reach their destination (like in N.Y.C.). When there are five or six lanes of traffic, like say, on Venice Boulevard, cars have to merge over too many lanes to make a turn and the flow of traffic gets messy. Allyn Rifkin spent 34 years as the chief of L.A.'s transportation bureau. 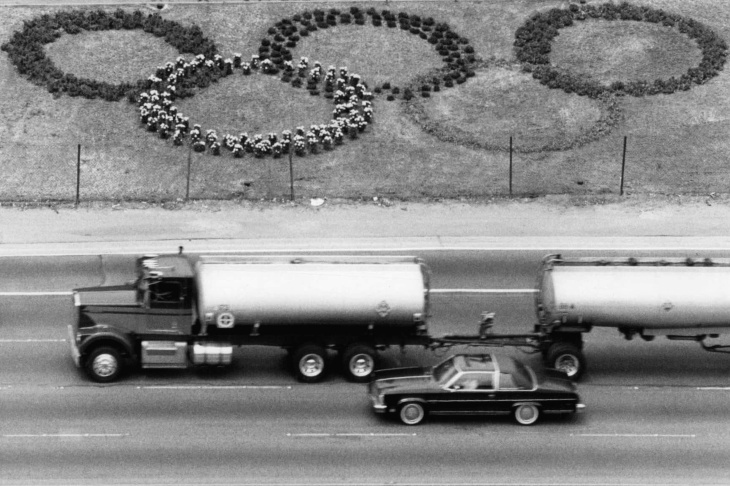 When he retired, he, along with a team of LADOT workers, received a special assignment for the 1984 Olympics — fix the traffic on the Westside. At that point, there was already a massive bottleneck of commuters going from West L.A. to downtown during the morning rush hour (and reverse in the evening) and the situation was starting to become untenable, Rifkin said. Add the Olympics into the mix and city officials quickly realized that things could go from inconvenient to embarrassing if they didn't do something. The plan was to station the Olympic Village (where athletes stay) at UCLA, but the actual games would happen at the Colosseum (by USC), so if things stayed as they were, Olympians would be stuck in traffic on buses for hours — not a good look for the city. LADOT found a temporary solution. They proposed making Olympic and Pico one-way to ease traffic. Olympic would go westbound, Pico would flow eastbound. Rifkin says he was inspired by a success story out of Washington, D.C., in which reversible one-way streets alternate direction depending on rush hour. The plan was implemented during the games, Rifkin said. And it worked: traffic was reduced and the athletes were smoothly shuttled from Westwood to the Colosseum in one piece. But residents were not pleased. "If you were going one way on one street and then you had to get back to where you were coming from, you'd have go through some residential streets to go back to where you started," Rifkin said. "The people living in the neighborhoods between Pico and Olympic didn't want all that traffic going through their neighborhoods. So they said, I don't think so." Business owners were also concerned that they would get less customers if people only passed them once a day instead of twice. Or if a potential customer drove past them and then, because of L.A.'s signature long blocks, had a hard time doubling-back. So the streets went back to their original two-way selves and equilibrium resumed (by equilibrium, we mean traffic). Over the years, others attempted to bring back the one-way street plan, including Richard Riordan in 1994, but it never picked up enough steam. In 2007, there was renewed interest in the Pico and Olympic experiment (because traffic) and Rifkin was again assigned to investigate. 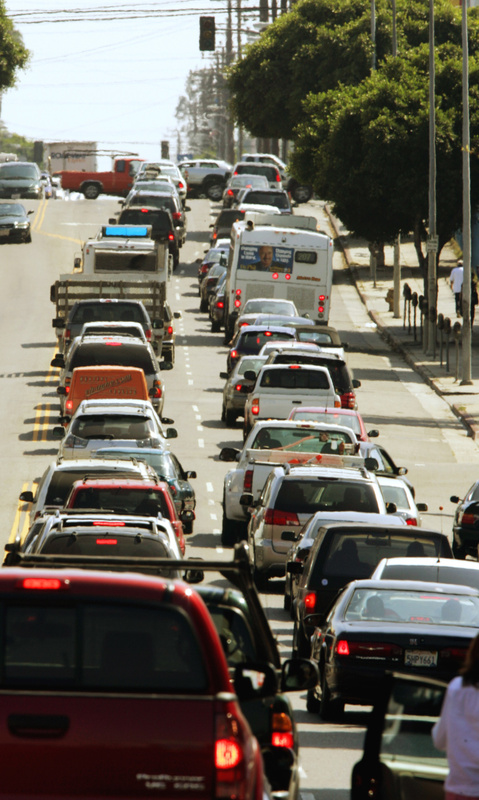 His 39-page report, commissioned by County Supervisor Zev Yaroslavsky and released in April of that year, found that making both streets one-way again could increase the capacity for cars by 20 percent, with a proportional decrease in congestion. "I even tweaked the idea a little bit and tried to make it transit priority street," Rifkin said. "Olympic Boulevard has eight traffic lanes — I tried to make 2 of them for busses only." Rifkin and his team had hearings in local communities to get feedback from residents. But alas, Rifkin said, "No one wanted it." "It was a big deal for a year or two," said Wachs. "People were arguing about it and eventually the circuity of it became unpopular. Driving around long blocks to get home adds quite a lot to travel time to short trips, even if it makes long commutes shorter overall." In 2008, Antonio Villaraigosa tried yet again to implement a similar plan, but westsiders enthusiastically opposed, despite a 2008 Rand Corporation study, which found that converting some of L.A.'s streets into one-way thoroughfares could increase vehicle capacity by as much as 50 percent. One city councilmember went so far as to call the plan an "insult" to his constituents. Ironically, neighborhood residents would later complain that navigation apps like Waze and Google Maps would lead drivers to speed down these same small streets, but who could predict the future? Sticklers and skeptics alike will ask why downtown is an exception to the lack-of-one-way-streets rule? Downtown is what urban planners call a close grid or a fine grid. It's very predictable and the blocks are shorter, making it more one-way friendly. "Downtown is more dense," Rifkin says. "And it doesn't have that mixture of commuters and residents." 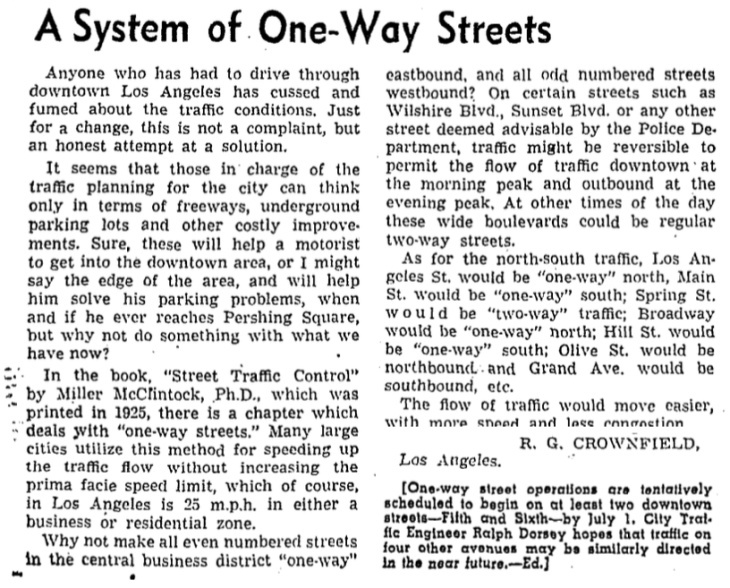 In 1947, fifth and sixth streets were converted into one-way roads by city planners, to increase the flow of traffic— they were actually the first one-way streets in Los Angeles. Spring, Main, eigth and ninth streets followed suit to ease congestion created by the contruction of the Harbor freeway and the convention center. There are a couple of outliers like Broadway, which has always been two-way. Why? Because it was always meant to be the main shopping street in the area, and if you recall the 1984 ordeal, a lot of people think that one-way streets are not good for business. IS L.A. BECOMING MORE ONE-WAY FRIENDLY? Now maybe you're starting to see one-way streets as the underdogs in this tale of love and urbanization. They just wanted to help relieve traffic, but the public rejected them, time and time again. Well, the tides might be turning. Because of the whole Waze debacle, some neighborhoods are now asking one-way streets to take them back. 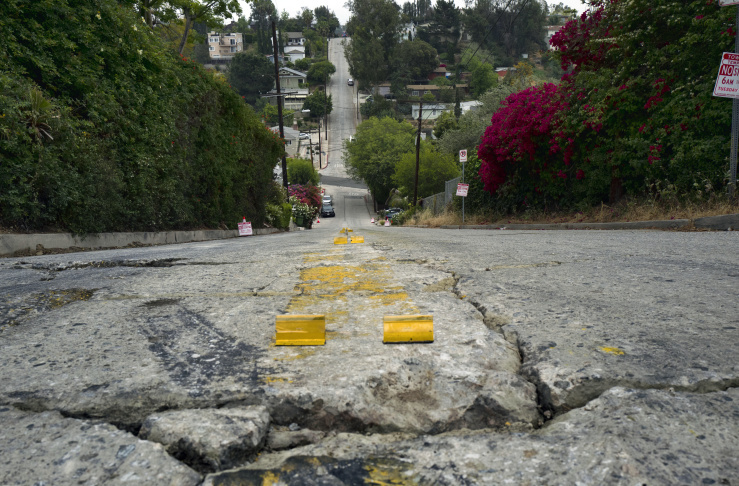 "I live in Silver Lake and at the last city council meeting people were arguing about making Angus a one-way street because Waze is redirecting too many cars there from Griffith Park Boulevard," Rifkin said. The city already converted one block of Baxter Street in Echo Park to a one-way after multiple concerns about safety were raised. Rifkin says that if a street is designated one-way, Waze tends to avoid sending drivers down it, thus leaving neighborhoods to their quiet, pre-navigation system days. So, will one-way streets ever make it big in the city of stars? We don't have an answer yet, but in the meantime, please enjoy this letter to the editor from the March 17, 1947 edition of LA Times. This was right before those downtown streets were converted to one-ways and this reader is very passionate in his plea. So you can think about this next time you're frustrated navigating downtown's fine grid.